You are at:Home»Lex Pedia»Lex Articles»Naturally Ours? 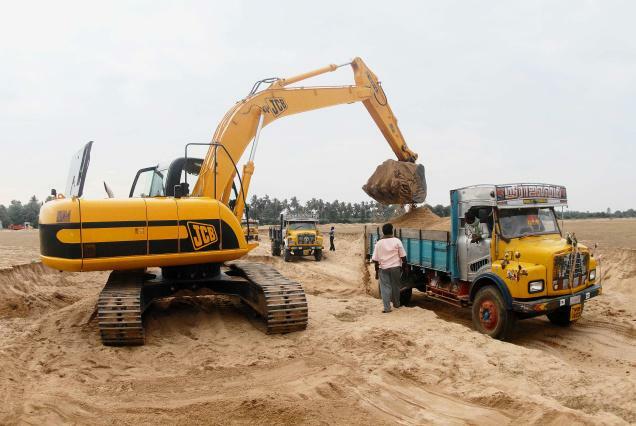 Close on the heels of IAS officer Durga Shakti Nagpal being suspended for taking on the sand-mining mafia in Uttar Pradesh, the National Green Tribunal (NGT) has ordered a suspension on river bed sand mining across the country. The NGT has said the clearances from the Centre needs to be taken before sand mining is done in any state. On paper, mining of any sort can only be done through licenses granted by the state. In reality, sadly, the long rivers that India is blessed with are ravaged, indiscriminately and unsustainably, for sand-mining, without licenses. In this light, the NGT order is very important not just for its regulatory quality but also for bringing an important idea to centrestage: who do environmental resources belong to? How much of these resources can be used and in what manner? Think about the air you breathe, the sand between your toes on a river bed, the pebbles that rivers deposit, knocked clean and smooth by river water. Then, think about trees that are lopped for branches, grass taken for fodder and hunks of limestone broken off for construction. Most of what we use is derived primarily from nature: including some of the things most tightly bound to human refuge: like glass, steel and stone used for our homes. The environment is a source of natural resources but it is also a bevy of natural ecosystems harbouring biodiversity. As consumers of both ecosystem services (such as fresh air and clean water) and consumers of resources (for instance sand, which gets converted to glass and construction material) we have a critical role in regulation of environmental resources. Clearly, if we do not regulate our use of resources we cannot ensure the sustainability of the resource itself. Further, the collapse of a certain resource can also lead to the collapse of the ecosystem. In the case of the Uttarakhand flood, it has widely been reported that sand and boulder mining at completely unsustainable (and illegal) levels exacerbated the impact of flash floods this monsoon. Deforestation and mining contributed to entire chunks of land being swept away by water. The ramifications are not just environmental, but social and political as well. Illegal mining has taken a toll not just on the environment but also on social structures: sand mining mafia has wrested control away from locals, and in Durga’s and officer Narendra Kumar’s case, away from the administration as well. Last year, IPS officer Narendra Kumar was crushed by a truck carrying illegally mined stone in Chambal. Back then, to the central question: who do natural resources belong to? The law provides some answers. India is a party to the United Nations Convention on Biological Diversity, whose foundational pillar is sustainable use of natural resources. Laws and licensing attempt to enforce a normative manner in which natural resources should be managed. Sand mining, for instance, can only be done after obtaining licenses from state governments. A bill on Mining of Minerals is currently pending with the government. The central idea is that the state government, under the public trust doctrine, is the keeper of environmental resources, and thus also its regulator. There have been several judicial precedents for this as well. In the case of Jagpal Singh versus State of Punjab (2011) the Supreme Court ruled that environmental commons cannot be used for private profit. Profit is a key concept that needs to be addressed through the discourse of sustainability. Profit, as opposed to sustainable consumption, or subsistence consumption, is one of the significant ways of looking at environmental governance. Let’s look at some of the other legislations in India: the Forest Rights Act (2006) allows traditionally forest-dependent communities to harvest natural resources, and for this, they do not need permissions or licenses. The implicit idea is that the extraction has to be done in a manner which is sustainable, as opposed to being for profit. In its recent order regarding mining in Niyamgiri in Orissa, the Supreme Court has ordered that the Gram Sabhas, or village councils, of the Dongria Kondh tribals (the petitioners in the case) should decide if they want mining in their area, which is proposed by Vedanta. This is based on a reading of the Forest Rights Act, acknowledging in effect the right of forest-dependent communities to have the first right over the use of resources they are dependant on. Again, this is underpinned by the sustainability concept, as key to this approach is the idea that it is the duty of forest-dependent communities to sustainably use, and thus in effect protect and foster, natural resources. But does sustainability underpin other operations related to resource extraction, especially activities of organised cartels? The answer is a resounding no. Mining mafias in various states have become so entrenched that Courts have had to respond with complete bans and moratoriums. The moot point in these operations has been indiscriminate mining, indiscriminate hoarding, and illegal profits. This brings me back to the Constitution of India, a shining light for many of us. The Supreme Court has said that the Right to Life, mandated under the Constitution of India includes the right to clean air and water. The Constitution also states it is the Fundamental Duty of citizens to protect the environment. The Environment Protection Act (1986) is the primary ‘teeth’ we have for enforcing this idea: our activities have to be both sustainable, and also, be done without causing indiscriminate air and water pollution. If you enjoy seeing the moon shine its light on you on a clear night, it is also pertinent to remember that the moon is, under public trust doctrine, a ‘Common Heritage of Mankind’. I’d like to bring that idea closer home, and emphasise that our natural resources—the sand under your feet—is also common heritage, and not just common resources. Sustainable and reasonable use of such resources, with regulations, is the order of the day, for us as well as the heritage we leave behind us.